This article offers a step-by-step guide to rolling over in Talis Aspire Digitised Content (TADC). If you'd rather watch a demonstration, please watch our webinar recording on making your rollover a success. To rollover multiple digitisation requests you will need to go to the 'Available for rollover' screen, which is accessed via the 'Rollover' menu. 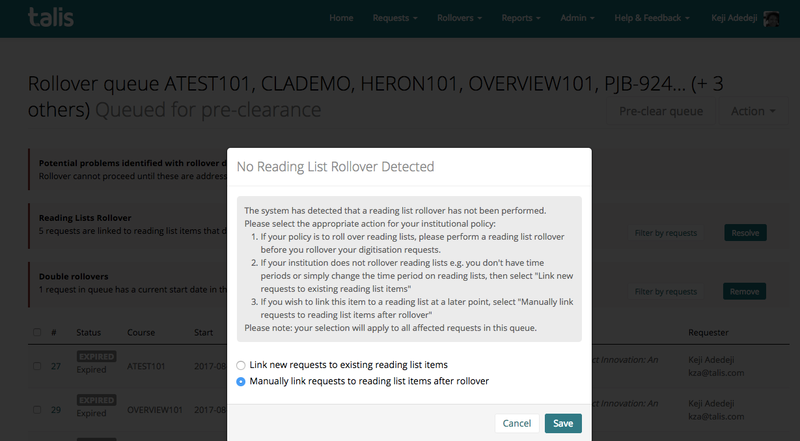 From the Available for rollover screen you can filter the requests to match specific criteria (ie. start and end dates, time periods, course codes, status, etc.) and then individually select the requests you wish to rollover by ticking the box to the left of the digitisation request number, or selecting all of the request on screen by ticking the box at the top left of the table. NOTE: This will only select the requests visible on the current page of the view (there is a maximum of 25 requests to a page on the available for rollover screen). 'Edit and Pre-clear' - This option allows you to review and edit the course details (Course title, code, student numbers), the requestor details, as well as the start and end dates for the new digitisation requests created via rollover. Only the edited information is changed, unedited information retains its original value. 'Pre-clear' only - This allows you to review and edit the start and end dates for the new digitisation requests created via rollover. Only the edited information is changed, unedited information retains its original value. or 'Add to existing queue' - This allows you to add the selected request(s) to an existing pre-clearance queue. This is useful if there are more than 25 requests you want to add to the queue. NOTE: You can only add requests to queues that are in the "Action Needed" stage. This option will not be available if your older queues progress to the "Review" stage. Start date - The next occurrence of the start month and day from the original digitisation request. e.g. if your course start and end dates are 1st August 2017 - 31st July 2018, and you are pre-clearing before the end of the digitisation's life, then the pre-clearance will default the new course dates to 1st August 2018 - 31st July 2019. If the next occurrence of the start month and day from today are less than the original requests end date, then it is one day after that day e.g. if your course start and end dates are 1st August 2017 - 31st August 2018, and you are pre-clearing before the end of the digitisation's life, then the pre-clearance will default the new course dates to 1st September 2018 - 31st August 2018 as a rolled over digitisation cannot start whilst the other is still live. If you are pre-clearing after the lifetime of a digitisation, then the default dates may vary depending on when you are pre-clearing. This is to allow for late pre-clearances as well as skipped rollovers needed the following year. Late pre-clearance: You may sometimes find out that an item is needed again after it has already expired. If you are pre-clearing less than a 1/3 of the course period after the end date of a digitisation, then the usual default is applied e.g. if your course start and end dates are 1st August 2017 - 31st July 2018, and you are pre-clearing before 1st December 2018, then the pre-clearance will default the new course dates to 1st August 2018 - 31st July 2019. Skipped roll-overs: You may sometimes skip a rollover but then need it again he following year. If you are pre-clearing more than a 1/3 of the course period after the end date of a digitisation, then a year's interval is added to the usual default e.g. if your course start and end dates are 1st August 2017 - 31st July 2018, and you are pre-clearing on or after 1st December 2018, then the pre-clearance will default the new course dates to 1st August 2019 - 31st July 2020. You can access your rollover queues at any time from the “Rollovers” menu, by selecting "Queued Jobs". 'Action needed' - these are grouped requests that are awaiting editing and have not yet been pre-cleared. 'In-progress' - these are grouped requests currently in the process of pre-clearance. 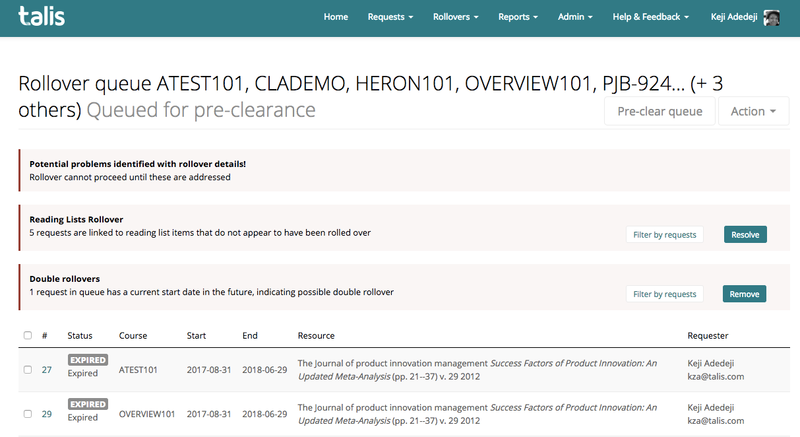 'Review' - these are grouped requests which have been pre-cleared and are awaiting review or specific actions before completing the rollover. The requests in a Review queue are displayed in tabs according to their status i.e. Successful, Referred and Rejected pre-clearance. The Rollover queues view displays the queue name (concatenation of the course codes in the group), the number of requests in the queue, the queue status, creation and last modified date of the queue and the creator of the queue. You can either complete a rollover selecting the rollovers in either of the above views and clicking the “Rollover requests” option, or by visiting the individual request and clicking "Complete Rollover". For FAQ's on TADC rollover, please see the FAQ's support article. From the "Available for rollover" screen, accessed via the Rollover menu, and selecting a single request. To see step-by-step instructions on rolling over via this screen, please see the 'Completing multiple/bulk digitisation requests rollover' support. From the "All requests" screen - click the 'Actions' menu and select “Begin rollover pre-clearance”. From the individual digitisation request's detail view - open the 'Actions' menu and select “Begin rollover pre-clearance”. NOTE: This option will only be available if the request is linked to a reading list item. Using either option 2) or 3) will open the edit and pre-clear window, allowing you to review and edit the start and end date, requestor details and course details (incl. student numbers) for the rollover digitisation request. The request will then commence validation checks. See the bulk rollover validation checks section above for information on this process. Once the request is validated, TADC it will then begin pre-clearance checks for the digitisation request and take you to the new digitisation request to process if referred, or complete the rollover if cleared by the concierge.